A very common question among businesses is how to get more customers from their social media traffic. This is an important question for every business, as social media goals should align with broader business goals. Social media has become a valuable channel to drive traffic to our websites, online promotions, and blogs. But, what do you do once you’ve driven traffic to those online assets? Before you start thinking about converting the traffic from social media into sales, take a step back and think about your lead generation process as well as your lead nurture program. Social media is often ignored or neglected in these processes, especially among small businesses, but they are essential in the discussion of capitalizing on social media traffic. After you’ve thought about your lead generation process and lead nurture program, and social media’s role in each, take a look at these 4 ways you can turn your social media traffic into valued customers. 1) Have a clear call to action in the content that you’re driving your social media audience to. Social media is a great channel to use when it comes to sharing and driving traffic to your content. Not putting a call to action in your content is a missed opportunity. Whether it’s to sign up for a demo, learn more about a specific feature or program, or to buy your product, a clear call to action should be present in every piece of content. These calls to action are the most straightforward way of turning social media traffic into customers. Below is an example of one of our basic calls to action in a blog post that talks about URL shorteners. 2) Have an email subscription option on your blog. If you’re generating a lot of social media traffic to your blog or website, make sure you have a way to collect these people’s email addresses. On your blog, a logical means to gather these emails is through an email subscription option. People will sign up to receive blog updates, allowing you to gather the email addresses of people already in your content, and often by association your brand or product. Take this database of email addresses and add them to your nurture program, the next step towards attracting them as customers. Note: In Canada you require people to express consent in order to add these emails to your nurture program. If you’re running a promotion on social media, increase your chance of getting more customers by sending your social media traffic to a landing page. Landing pages are a great way to provide valuable information about your promotion to your audience, which in turn can lead to increased conversions. 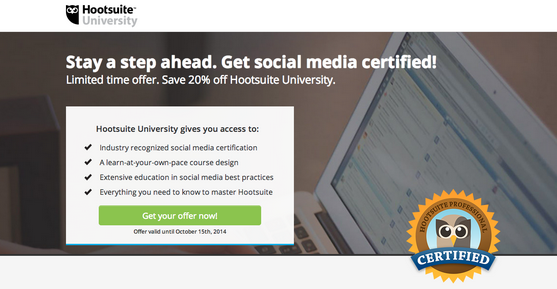 For example, Hootsuite University is running a back to school social media campaign right now that is accompanied by a landing page. Using landing pages provide you a higher chance of getting more customers from your social media traffic. YouTube is an excellent social network to generate social media traffic and get more customers. According to Shareaholic, YouTube drives the most-engaged referrals to websites. If you’re using YouTube in your marketing mix, make sure to include a call to action at the end of the video. Drive people to a landing page where they can sign up to buy your product or learn more about your product. The traffic you gain from YouTube is an excellent opportunity to earn new customers. Increase your social media traffic with Hootsuite Pro!